Free Shipping Included! PolarPro Red Filter for GoPro Hero6 / Hero5 Super Suit Housing by PolarPro at EISF. MPN: H5B-1001-SS. Hurry! Limited time offer. Offer valid only while supplies last. The PolarPro Red Filter for the GoPro Hero5 SuperSuit housing will color correct your underwater videos providing you with vibrant tropical colors. The PolarPro Red Filter for the GoPro Hero5 SuperSuit housing will color correct your underwater videos providing you with vibrant tropical colors. The PolarPro Hero5 Red Filter uses a proprietary red color formula that delivers stunning color correction every time. 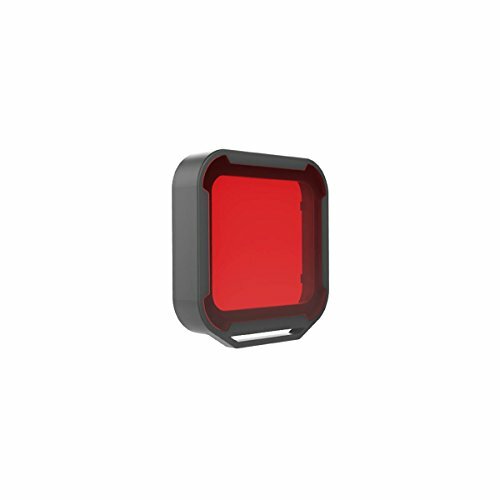 The PolarPro Red Filter is perfect for filming at depths of 15 to 75 feet in Tropical or Blue water. Simply push on the Red Filter and watch it turn your overly green videos into beautifully colored tropical masterpieces. Each Red Filter for the Hero5 is backed by a lifetime warranty ensuring you will have a lifetime of vibrant underwater videos. If you have any questions about this product by PolarPro, contact us by completing and submitting the form below. If you are looking for a specif part number, please include it with your message.